Julie Underriner lives and works in the Texas hill country near Austin. She is a contemporary color field painter who works with the luminosity and transparency of paint to create dynamic expressions of color. From 2006–2011, Julie studied studio painting and drawing at the Houston Museum of Fine Arts Glassell School. In the course of her studies, she found herself strongly drawn to abstract painting, feeling that abstraction gives her the freedom to focus on the interaction of color and form in a compelling way. 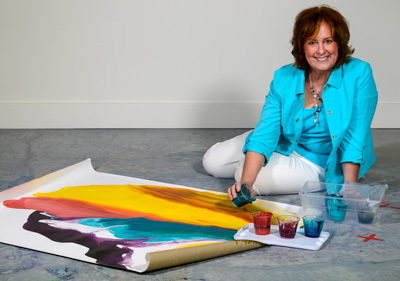 Since 2012, Julie has studied color field painting privately with Bette Ridgeway. From 2012–2014, Julie was a founding member of the Wimberley Fine Arts Center Artist Co-op. Julie’s work has been exhibited at Duke University, the Dougherty Arts Center (2015), the Brookwood Community Art Gallery, the Austin-Bergstrom International Airport, the Art League of Houston and the Wimberley Valley Art League. Julie has received numerous commissions for private collectors in Texas area. Julie’s work has also served as a visual case study for Dr. Roberto Zenit in his lecture entitled “Rayleigh-Taylor Instability Creates Provocative Images in Painting.” Dr. Zenit’s study was presented at the 2014 Conference on Fluid Mechanics Research at the California Institute of Technology.